When an elderly woman was unable to provide medical care for her beloved cat, animal control got her help rather than treating the case as one of neglect. 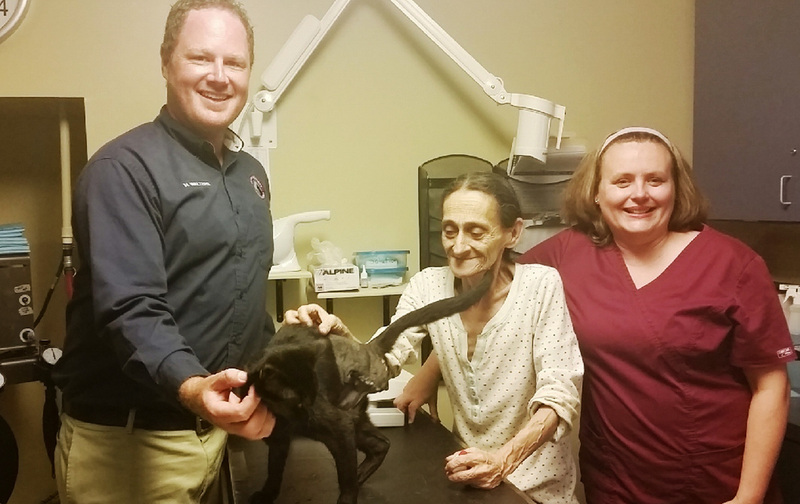 From left: Nate Walters, St. Johns County Animal Control Officer; Rondo, the cat; Mildred Hurley, Rondo’s owner, and Dr. Isabelle Roese, St. Augustine Humane Society veterinarian. When an elderly woman was unable to provide needed medical care for her beloved cat, animal control helped find a way to get treatment for the cat, rather than treating the case as one of abuse or neglect. Someone dropped a dime on elderly St. Augustine, Florida resident Mildred Hurley when they contacted St. Johns County Animal Control officer Nate Walters with an anonymous tip regarding her cat Rondo, an unneutered male kitty who was suffering with an untreated broken leg. When Walters visited her home, Ms. Hurley was afraid that Rondo, who she’d raised from the time he was a kitten, would be taken from her. After spending several days getting to know Hurley and gaining her trust so he could take a look at the injured cat, the animal officer determined that Hurley cared deeply for Rondo but was unable to pay for his medical care and feared losing him. The elderly woman had done her best for Rondo but was experiencing hard times and didn’t know where to turn when he became injured. Rather than reporting Hurley and taking Rondo from her, Walters got in touch with the St. Augustine Humane Society and asked if they could help. When St. Augustine Humane Society vet Dr. Isabelle Roese examined Rondo’s serious break she decided the best option for him was to amputate his leg. Rondo got his amputation surgery and neutering at no charge. The costs were covered by a renewable grant from Banfield Charitable Trust and the Humane Society. “I understand there are people who are down on their luck and having a hard time,” said Walters. Thanks to the compassionate problem-solving attitude of the animal control officer and assistance from the animal welfare organization, Rondo is no longer suffering and is doing well, and his petmom still has the companionship of her beloved pet. How To Make Popsicles For Cats! this is so good! so happy they could help her out. I know that when you dont have enough money bad things can happen to your cat. this happened to me when I was lived in brasil.